The Canton girls weren’t expected to be victorious against Fairfield Warde on Saturday afternoon and yet they couldn’t wait to take on the tougher, Class L team. Geoff Genser talks to local parents about teens. CANTON – Parents are all too well aware that their children’s school and academic lives are drastically different from their own experiences. But while there are a multitude of modern stresses to compound age-old challenges, there are some techniques parents can use to help their teens cope. Some seemingly simple, but not always easy, ideas include asking adolescents to share a positive experience from their day, inquiring about 7th grade dating life and even tougher issues, easing the pressures about getting into the right college and getting them to take a break from smartphones and social media. Facilitators at a recent teen parenting forum had these suggestions and a wealth of others to help teens reduce their level of stress, a huge factor in many of today’s social and emotional issues. The forum, “Navigating the Teen Years in a Society that Never Sleeps,” co-sponsored by the Canton Schools, Canton Youth Services Bureau and the League of Women Voters of Canton, was recently held at Canton Middle School. Professionals from the Family Resource and Development Center of West Hartford, along with Student Services Personnel for Canton Middle and High Schools, presented the program. Arnold Orde works on hanging one of the banners. CANTON — Thanks to funds supplied by the Canton Athletic Booster Club, several new banners have added a new look to the Canton Middle/High School campus. The banners are hung from light poles near the school exit and entrances as well as the vicinity of the track and multi-field facility. They include a variety of messages of logos and academic, athletic and inspirational themes. Those include “Home of the Warriors, “Pursue Excellence” and “Commit to Integrity.” The banners dovetail on other recent efforts, such as upgraded banners in the gymnasium. While some of the banners are more academic in nature, Bonini said they also dovetail nicely with recent sports successes and a push to add more signage and banners throughout the school. Members of the Cherry Brook Primary School Chess Club. On a warm and sunny afternoon, 14 students from Cherry Brook Primary School in Canton and 3 students from Canton Intermediate School traveled a few miles east on Route 44 to meet up with their peers from Roaring Brook School in Avon for the 1st Annual Albany Turnpike Chess Challenge. The evening was started off by well-known chess guru, David Aldi, who is the inimitable coach of Roaring Brook’s Chess Club. Before starting he explained a few strategic and complicated chess maneuvers to the audience of over 50 students and adults. Music for Pieces of Wood by Stephen Reich – Rowan Cookman, Mia Tuccillo, John Solomon, Zach Oliver, Jacob Allen. Editor’s Note: This young girl’s identity is common knowledge in town and is being reported elsewhere but Canton Compass has still decided to withhold her name at this time. Our deepest sympathy to the family. CANTON – The local community is reeling with the tragic news that a local 7th grader died from injuries sustained in a tragic incident Sunday afternoon. Students at Stepping Stones Educational Center, many of whom had recently protested tree cutting by Eversource, received an Earth Day surprise on Friday. Everscource representatives came to the school and delivered 48 tree seedlings, school officials said. The students had recently chanted “Save Our Trees Please” as crews across the street cut several trees near power lines across the street on Route 44. One of the young trees was planted at the school on Friday and students each took one home. “We want you to know that these kids did make a difference,” Stepping Stones owner Rob Amrein and Director LaNelle Stanhope wrote in a letter home to parents. Eversource has received some criticism for aggressive trimming and cutting along roadways but the company said some trees can wreck havoc on the electric system. The company said it seeks to strike a balance. See our original story here, as well as a related letter to the editor. For more photos, visit https://johnfitts.smugmug.com or click on the above photo. 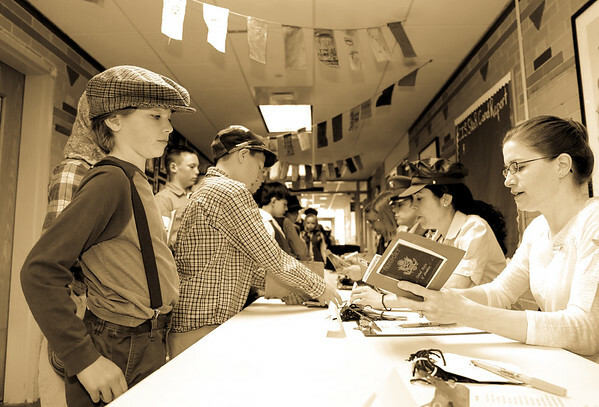 It’s become a Canton Intermediate School tradition and on Tuesday local fourth-grade “immigrants” continued that wave as they came to Ellis Island in hopes of fulfilling the American dream. Students form an energy circle prior to “breaking the silence. On Friday April 8, the hallways of Canton High School were significantly quieter as approximately 80 students chose to participate in National Day of Silence. During the National Day of Silence, officially observed on April 15 during Canton’s Spring Break, students across the nation choose to avoid communication in an effort to spread awareness of LGBT (Lesbian, Gay, Bisexual, Transgender) voices that are often silenced by harassment – or worse. Throughout the day, many students reported that remaining silent can be difficult and intrusive on schoolwork. CANTON, NY — Walter T. Dylag of Canton will earn an academic award during the SUNY Canton Sheldon Katz Honors Convocation at 4:15 p.m. Wednesday, April 20, in Roos House Convocation, Athletic and Recreation Center. Dylag earned the highest grade point average as a second semester freshman in SUNY Canton’s Civil and Environmental Engineering Technology Bachelor of Technology program. Dylag is a 2015 graduate of Canton Central School.